Description and contents: A 52 page adventure-oriented city supplement describing the city state of Zothay, a walled town of some 4000 inhabitants controlling its small area of the Wilderlands, but likewise subject to an external power – the alliance between the Skandiks of Ossary and the lord of Kauran (in my campaigns, a major city state of some 10,000 people). 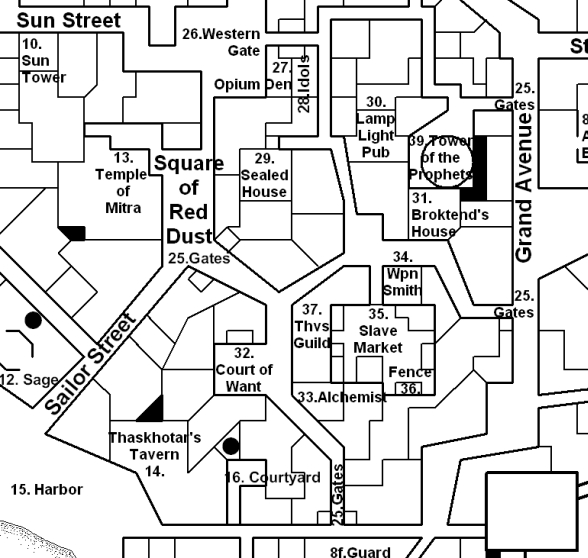 The supplement outlines the political power groups, districts, laws and customs of Zothay, as well as 40 locations therein, many with custom rumours charts, adventure hooks, possible “missions” and more complications. 20 pages of appendices add general rumours, random encounters, sample caravans, the Prophets of the Wastes (a “caste” of militant desert ascetics whose strange dedication to an abstract faith is a cross between fanaticism and the non-human) and a handful of mini-adventures beneath and about the city proper. 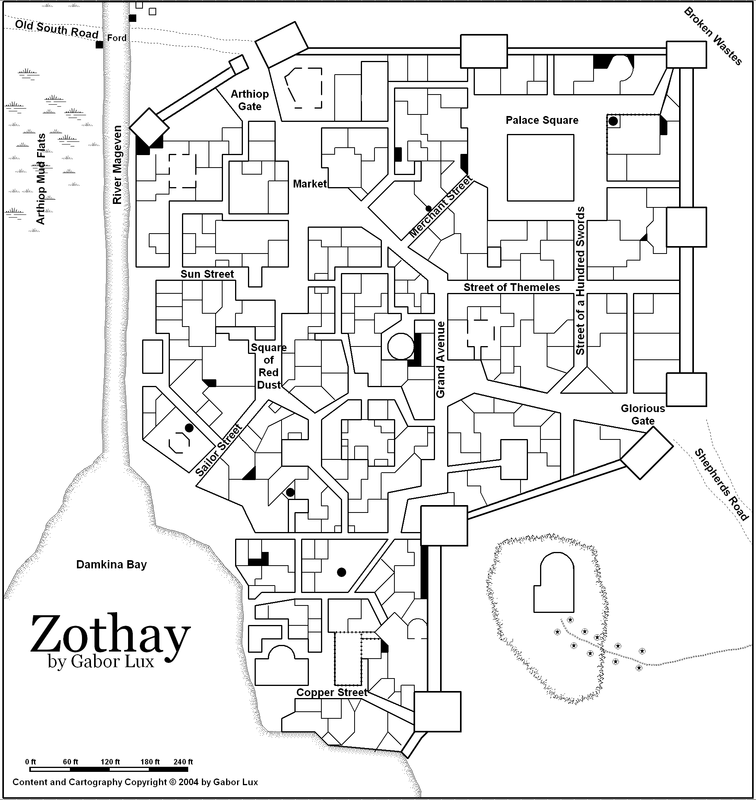 Design notes: Zothay is a mostly successful experiment in creating a complex city environment suitable for gaming use. While I have always found it easy to get my players involved in city intrigue, crazy heist schemes, meetings with bizarre and often malevolent NPCs or just random calamities, most of these were never committed to paper and probably never will. The greatest boon of cities is openness and the plethora of choices at almost any point in time (as opposed to most small and medium-sized dungeons, which are self-contained and only present a limited array of obvious choices at once), but this also makes them hard to distil into written form. The best of the experience – the crazy dynamism, the way player and NPC agendas reshape not just the environment they all operate in but also the goals, methods and broader scope of adventure – cannot be replicated, and trying to make a set of people enjoy the same course of cool events as their predecessors is a self-defeating proposal. One of the methods to capture the spirit of openness in the original adventures is to present a loose set of ideas, goals, NPC agendas and locales to build on. 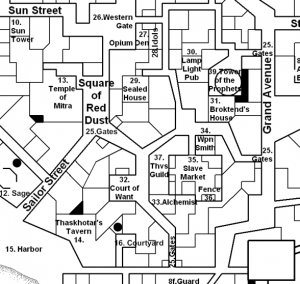 The other, which is the approach taken in Zothay (and going back to the wellspring of it all, Bob Bledsaw and Bill Owen’s splendid City State of the Invincible Overlord), is to give the GM the entire sandbox with its wealth of options and information. Naturally, information is problematic: as the Hungarian gaming scene’s pointless obsession with mundane detail and “realism” shows, too much of it or the wrong kind of it can not only fail to help the GM’s job in creating an imaginative adventure, but actively hinder it. Good information, in my mind, fulfils two purposes: it is suggestive of a broader context instead of over-describing it, and it is conductive to its purpose – some of which serves to evoke a certain mental image, but more often to encourage action. Therefore, the information in Zothay deliberately focuses on things that lead into more adventures: the interconnected strands of rumours, adventure hooks, NPC relations and group interests serve to get the players involved – first in missions, but eventually also in the culture, politics and complex environment of the city state. The way all of these blocks of information are stacked against each other, it only takes a minor disturbance from the players to set things into motion and send them crashing down in some direction. (It may be an interesting lesson to recount the two campaigns where the party adventured in Zothay: in the first, the visit was cut short when the characters mistakenly picked a fight with the local thieves guild and were forced to flee before being discovered by the authorities; in the second, the actions of the players eventually lead to an undead invasion from the sea and the city state’s partial destruction.) 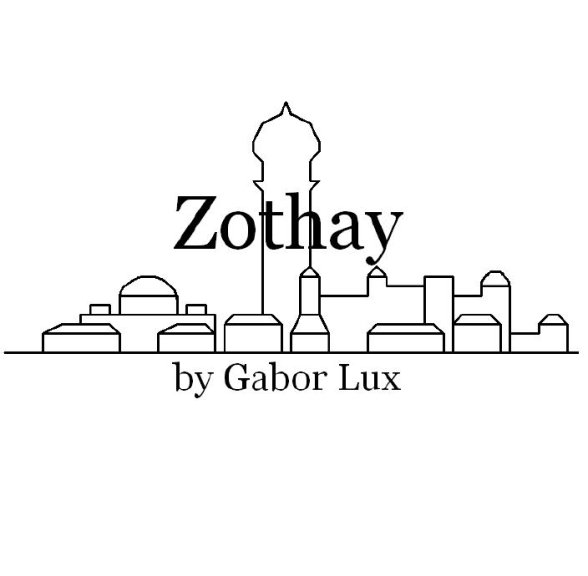 Zothay is, thus, an instrument to generate adventure (interaction), and through that interaction, context. Beyond that, there are some interesting explorations of ideas I personally find intriguing. 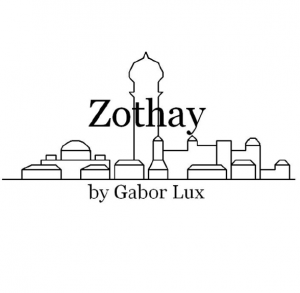 There is my fascination with enclaves, exclaves and parallel power structures – as a subjugated city state, Zothay basically had to give over its inner city to criminals, spies and vagrants, and while there is an uneasy coexistence, a clash between agendas of containment from the outside and subversion from the enclave can become a dominant issue in the campaign (enclaves make a return in Khosura: City State of the Four Mysteries with its religious and tradition-based jurisdictions reminiscent of Old Berlin and Jerusalem, as well as a different look at the same concept in the partially tested City of Vultures). The supplement also has a selection of “hidden places” – opportunities to discover locales sealed in the distant past, expeditions into other realities and a possibility to discover things that can completely change the players’ understanding of their present environment. Finally, what’s better to do in a city than shop? Zothay has plenty of opportunities to do that, and in addition to getting those coils of 50’ rope and iron rations, there are baths, exotic items and potent drugs to waste money on. This element of bargain-hunting, gambling (because who knows what that 450 gp spent on a magical cloak embroidered with golden flies will really get you) and more discovery adds a new, entertaining spin to the city experience.